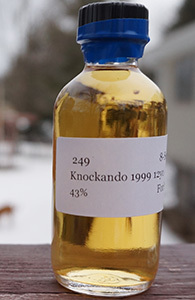 I don’t know much about or have much experience with Knockando. It is one of Diageo’s less glamorous distilleries and the only thing that makes them stand out is that they put a vintage and an age statement on their bottles. The only one I’ve tried to date is the 25 yo that was part of the special annual release a couple of years ago. I thought that was pretty good but it didn’t particularly wow me (perhaps because I tasted it alongside some powerhouse sherried malts). Will this 12 yo hold any surprises? Let’s see. Nose: Mild sherry notes–some citrus, some milk chocolate but also some dusty and grassy notes. Nothing terribly exciting. With more time darker notes emerge–raisins mostly. Water lightens the nose and re-emphasizes the citrus. Palate: As on the nose–the citrus and grassiness are most to the fore. Some mild raisiny notes too. Very thin mouthfeel. On the second sip there’s a low-level but pretty pervasive metallic bitterness to go with the citrus. I’m picking up a very faint soapiness as well. The bitterness expands as it goes. Let’s see if water improves this. Well, it cuts down the bitterness and lets the citrus come back to the fore but the already watery texture is done no favours. Finish: Medium. Nothing interesting though. Some of the citrus lingers but mostly it’s grassy malt and that bitterness. As on the palate with water. Comments: Mostly inoffensive and drinkable but there’s nothing even barely distinctive about this. I think I understand why Knockdhu were worried about being mistaken for Knockando.